Argentina’s Bodega Colome has the unique distinction of being the home of the ‘highest vineyard in the world.’ At approximately 10,207 feet, the vineyard produces a wine like none other in the world. Elevation in Argentina is a factor in quality. The rule is, the higher the better. Extreme weather and terrain create a thicker skin on the grape, making for a more complex flavor profile. 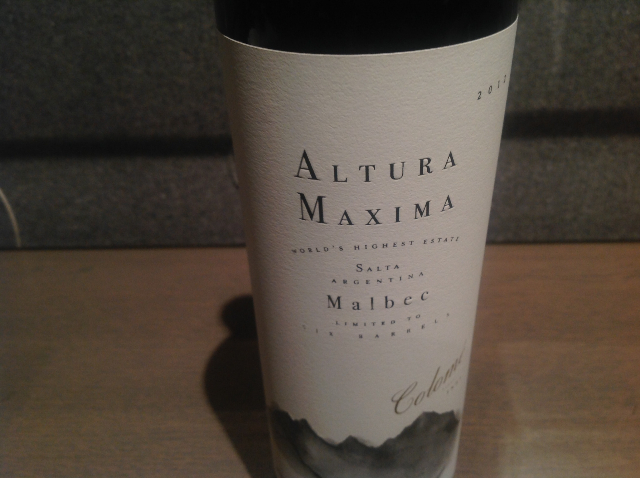 The 2012 Colome Altura Maxima ($125) is the first vintage released by the estate after ten painstaking years of understanding the environment and the conditions at this extreme altitude. Colome is a family-run business and the crown of Hess Family Estates, of which there are seven worldwide. Hess Family Estates evolved in 1844 as a company with a deep commitment to responsible business and agricultural practices. In its fourth-generation, besides new world wines, Hess focuses on properties, hospitality and contemporary art. Bodega Colome was founded in 1831 and is one of the oldest wineries in Argentina. Winemaker Thibaut Delmotte quest for the special Malbec resulted with the release of the Altura Maxima. He recently explained how difficult it is to keep tabs on a vineyard at that altitude. The wine is distinct, complex, bold, intense and unlike all others that I have sampled. As a journalist, I feel extremely lucky to have sampled this historical release. Only 165, three-pack cases have been released. There are four estate vineyards that comprise Colome: Altura Maxima (10,207 feet), El Arenal (8,530 feet), La Brava (5,740 feet) and Colome Estate (7,545 feet). All of the vineyards practice sustainable farming. Malbec was planted pre-phylloxera. Some vines are 160 years old. Colome’s second label is Amalaya. Between the two labels, the five wines I sampled, in addition to Altura Maxima, are great values and retail for under $25 a bottle. These are the wines that should be on your radar. 15 months in French oak barrique followed by 6 months in the bottle. Floral aromas abound mixed with red raspberry, strawberry and mango. Acidity supports the dark plum and blackcurrant concentrated flavors. A peppery spice is absorbed during the long and lingering finish. It’s a classy wine that is ready to drink. The wine is intense in color, nearly black. The mixed aroma of candied cherries and figs dominate. My palate was full of crisp acidity. The concentrated fruit was robust with mature tannins that led to both balance and structure. The wine is lively and a show stopper. A touch of strawberry, ripe raspberries and white pepper make a luscious bouquet before flavors of vanilla, hickory smoked bacon, black pepper and Indian spice merge on the palate. Robert Parker gave this wine, 90 points. Need I say more? Citrus notes arouse the palate with flavors of lemon sorbet, honeysuckle and tumeric. Fresh and crisp, the blend of Riesling and torrontes shine on the palate. A stunning, bright wine at a fair price. As you can see, I am a big fan of all of these wines. The quality and price points make each bottle a value for the consumer.